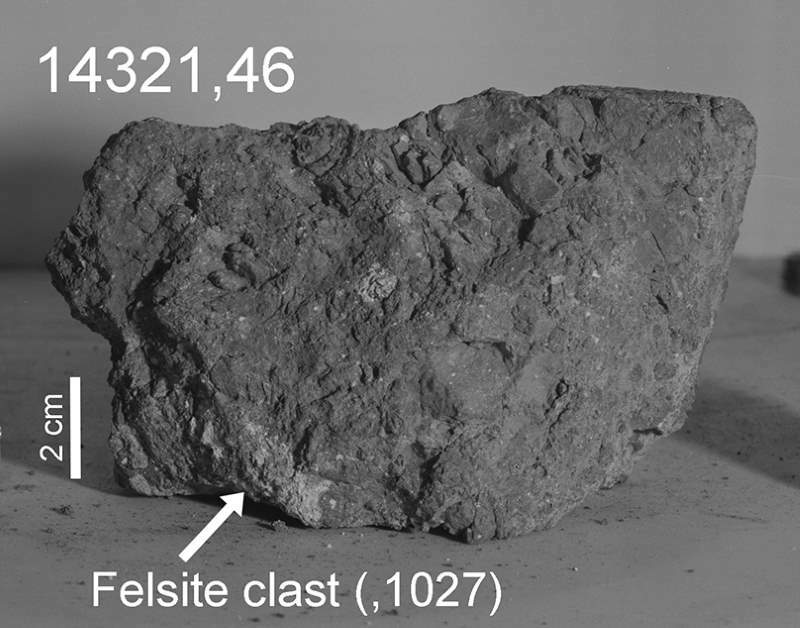 An international team of scientists discovered that the lunar sample returned by the Apollo 14 astronauts may contain a piece of rock ejected from Earth from about 4.0-4.1 billion years ago. The rock fragment was produced and ejected from the Earth to the Moon in a large impact event. A large asteroid or comet impact jettisoned material through the Hadean Earth’s Notes 1 primitive atmosphere, into space, where it collided with the surface of the Moon. There it was subsequently mixed with other lunar surface materials into one sample. Around that time, the Moon was much closer to the Earth than it is today – it was some 80,000 miles away (around 129,000 km). Today, the average distance between Earth and the Moon is 384,400 km (238,855 miles). As a result, our satellite was 2.8 times larger in the sky than it is today. That is also mean there were far more lunar and solar eclipses than there are today. Astronaut Alan B. Shepard Jr., Apollo 14 commander, assembles a double core tube as he stands beside the rickshaw-type portable workbench or modularized equipment transporter (MET) unique to this mission. The photograph was taken by astronaut Edgar D. Mitchell, lunar module pilot, standing some 170 meters northeast of the Lunar Module (LM), during the mission’s second extravehicular activity (EVA) on Feb. 6, 1971. While astronauts Shepard and Mitchell descended in the LM “Antares” to explore the Fra Mauro region of the moon, astronaut Stuart A. Roosa, command module pilot, remained with the Command and Service Modules (CSM) “Kitty Hawk” in lunar orbit. Apollo 14 was the eighth manned mission in the United States Apollo program, and the third to land on the Moon. This photo was taken on February 6, 1971. This is a cropped and resized image. You can see the original photo on the NASA Spaceflight website. Is it really the oldest rock of the Earth? In the last decades of the 20th century, geologists identified a few Hadean rocks from western Greenland, northwestern Canada, and Western Australia. The oldest minerals found on Earth come from Western Australia’s Jack Hills and are up to 4.46 billion years old. But those dates have been disputed. Even if the minerals founded in Australia really are that old, they’re debris left over from rocks that disintegrated long ago. By contrast, the Apollo 14 fragment is much more fully preserved. Jeremy Bellucci, a researcher at the Swedish Museum of Natural History and the lead author of the study says: “It is technically a ‘rock,’ whereas the Jack Hills [minerals] are individual, contextless crystals”. The rock bearing the suspected piece of Earth is formally named 14321, it is one of the largest that the Apollo missions brought back from the moon. It was collected by Apollo 14 astronaut Alan Shepard on February 6, 1971. The Hadean is a geologic eon of the Earth which began with the formation of the Earth about 4.6 billion years ago and ended 4 billion years ago. “Hadean” (from Hades, the Greek god of the underworld, and the underworld itself) describes the hellish conditions then prevailing on Earth: the planet had just formed and was still very hot owing to its recent accretion, the abundance of short-lived radioactive elements, and frequent collisions with other Solar System bodies. Part of the ancient planet is theorized to have been disrupted by the impact that created the Moon. Previous PostMeteorites do not fall to EarthNext PostEarth without Moon – what would it be like?